Kids Reading to Succeed: October 2009: Back to School! October 2009: Back to School! 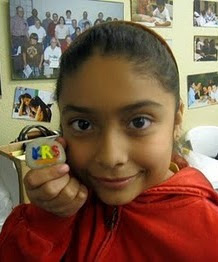 On October 3, 2009, KRS resumed our Saturday reading club! Both the KRS kids and volunteers were excited to see each other, enjoy some good books, and personalize some notebooks/journals for school! For our Nov 7th session, we'll have a Thanksgiving-related theme for our reading and art sessions. Please come out & volunteer! Bring a Thanksgiving-related book (e.g., book about being thankful) to share with the kids! We're also excited about the great group of leaders who will be joining the Advisory Board this year; watch the November post for some info about our board members!